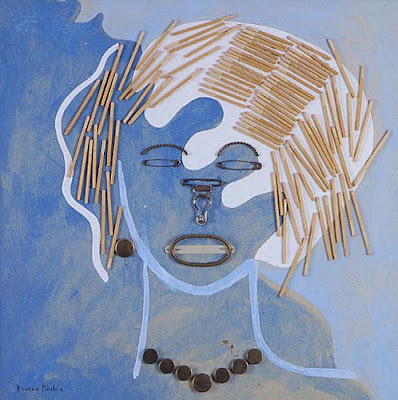 Totally forgot about Francis Picabia (January 28, 1879 - November 30, 1953). A longtime favorite of mine! I love his graphic paintings...and the little dadaist messages he weaves in. 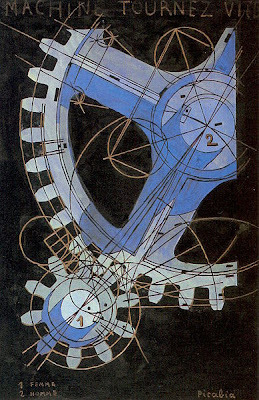 His work when it bumps up agains M. Marcel Duchamps assemblages (the chocolate grinder related work) is similar (the blue gears in Machine Turns shown above--in tone, line weight and use of the everyday to make a lovely composition disecting the machine, it's work and motion). He is recognized for mechanical portraits after his defined Dadaist period. There was a huge Picabia of a silhouette (I will give examples in next post)--about 9' tall at the Tate Modern along with an assemblage similar to that I have posted above. I just love these pieces. However, Picabia did some pretty dreadful drawn, overlappy, gouache images in the late 1920s...that do not measure up to the wonderful work done earlier...albeit in the same types of happy color palettes he seems to use. Interestingly,around 1911 he joined the Puteaux Group, which met at the studio of Jacques Villon in the village of Puteaux. There he became friends with artist Marcel Duchamp. Some of the group's members were, Apollinaire, Albert Gleizes, Roger de La Fresnaye, Fernand Leger and Jean Metzinger. I am currently adoring M. Leger as well...so maybe there is something there...by studying both artists at the same time.